Our maple mission chests are created from solid hardwood, and are designed to last. 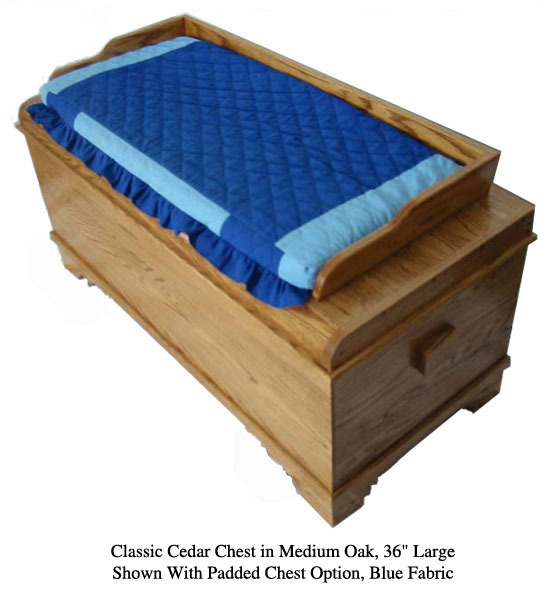 Each chest is handcrafted individually by an Amish craftsman. Please scroll down the page for more details on the mission chest. If you're unsure about the finish for your chest, we encourage you to order wood samples. Color accuracy on our website cannot be assured due to a number of variables including lighting, the camera used, and the settings on your computer monitor. 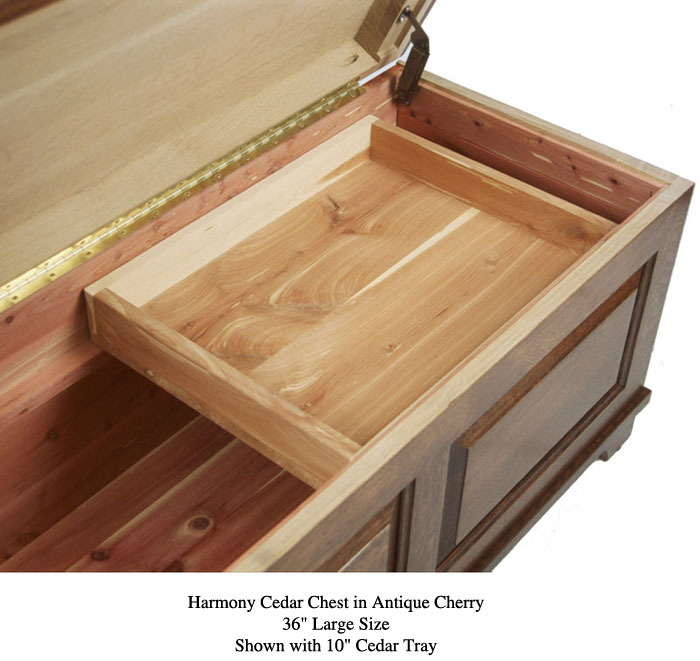 Cedar Chest Trays: Our cedar chest trays are created from solid unfinished red cedar. They ride gently upon a pair of cedar rails built into the interior, and lift out easily to reveal the interior. Click here for a photo. Our chest trays are intended to hold smaller, loose items while the main compartment of the chest holds larger items. Chest Casters: Casters allow your chest to roll along the ground, which is a useful feature for our larger cedar chests. The casters are installed prior to shipping, but are removed to prevent damage -- you need to 'pop them in' when the chest arrives . Casters can be set to one of two heights, suitable for use on a carpeted floor or a hardwood floor. Please select the appropriate caster height for the room you will be placing the cedar chest in. 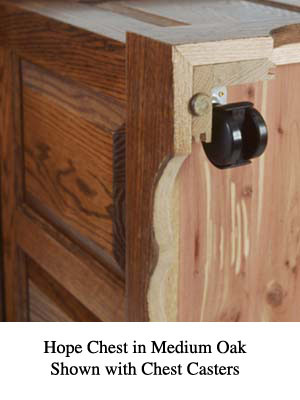 Click here for a photo of a caster installed on the bottom of a hope chest. Finished Rear Panel: Our cedar chests are made with solid maple hardwood on the front, top and side panels. The bottom and rear of the chest are finished with red cedar. The rear panel generally faces a wall or bed, and is not visble. Click here to see a photo of this option on a hope chest. This option consists of a rail to hold the cushion in place, and a cushion in your choice of color. Click here for a photo, shown on a classic cedar chest. To see additional photos of our mission cedar chests, see our Flickr photo gallery. Clicking on this link will open a new browser window. Each chest is created with 100% solid maple on the front, top and sides. The bottom and rear panels are finished with solid red cedar. This rear cedar panel generally faces the wall or bed. A finished rear panel option is also available, where the rear panel is created from solid maple to match the front of the chest (see under 'Product Options'). Genuine Solid Hardwood: Our classic cedar chests are created from 100% genuine hardwoods. There is no pine, plywood filler, pressed wood, "select hardwoods" or veneers used in our chests. Each chest is created by hand by Amish master craftsmen and is carefully inspected individually prior to shipping to assure its quality. To assure this quality, we offer a full money back guarantee and a full one year warranty against defects on our cedar chests. Small Oak Dowry Chest, 36" x 16" x 18"